The Music From Japan Festival 2017 marked the second year of MFJ’s Artist Residence program. 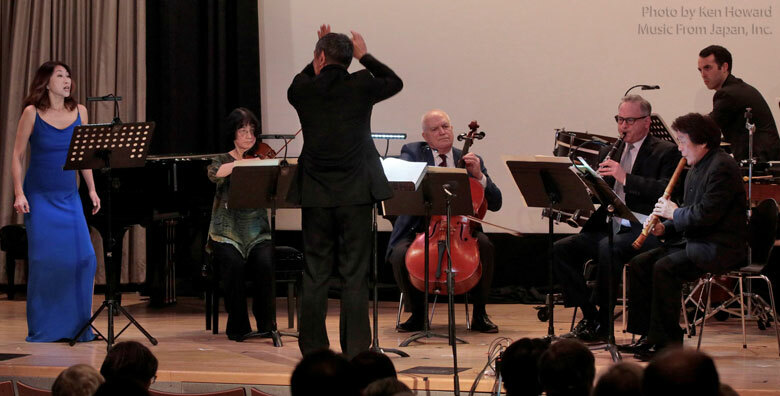 This year, we invited composer Kenji Sakai and musicologist Fuyuko Fukunaka to participate in a series of educational events, a symposium and two concerts. Both concerts included pieces commissioned by Music From Japan. 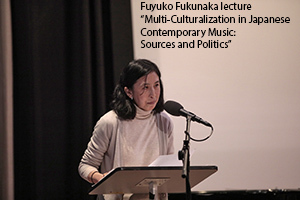 Musicologist Fuyuko Fukunaka gave an enlightening lecture called Multi-Culturalization in Japanese Contemporary Music: Sources & Politics. 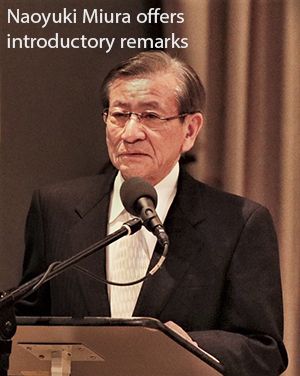 The lecture rebuked Western essentialism and orientalism and offered a more nuanced perspective on Japanese identity in music. She focused on several ideas in Western rhetoric about Japanese music, such as ma and stasis, and explained how these are not only insufficient descriptors for modern Japanese music but are also often misleading. Using the story of John Cage’s first visit to Japan as an example, Dr. Fukunaka described the complex relationship between Japanese identity and American projections of it. 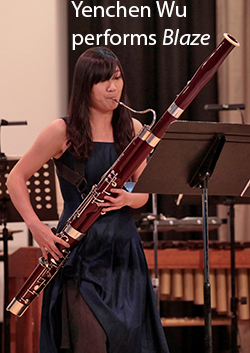 The Works of Kenji Sakai began with a virtuosic performance of his Blaze by bassoonist Yen-Chen Wu. 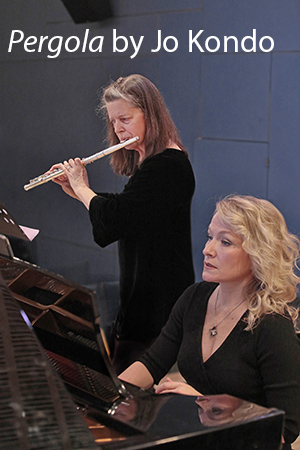 The piece was a flurry of arpeggios spanning the entire range of the instrument, interrupted by brief silences and more pointillistic textures employing extended techniques and long tones. 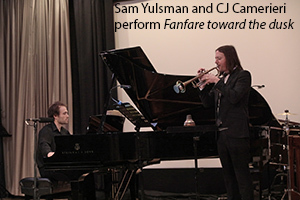 Fanfare toward the dusk, an extremely challenging piece for trumpet and piano, followed. The piece seemed based around a single repeated pitch interrupted by sometimes-abrupt transitions and improvisatory flourishes. 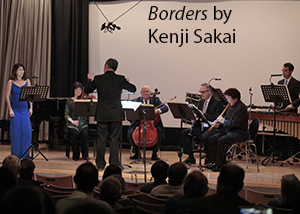 Borders a world premiere commissioned by Music From Japan, was conducted by the highly esteemed Yasuaki Itakura and featured the shakuhachi player Akikazu Nakamura, both of whom came from Japan for the performance. 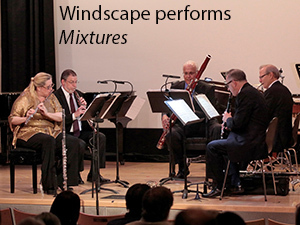 Finally, Mixtures, performed by the wind quintet Windscape, closed out the concert. The piece was beautifully executed by Windscape, and alternated between sustained chordal sections and more contrapuntal gestural moments. 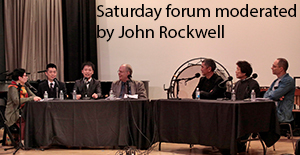 After the concert, music critic John Rockwell moderated a panel with Mr. Sakai, Yasuaki Itakura, Akikazu Nakamura, American composer Ned Rothenberg, and publisher Masaya Takagi. 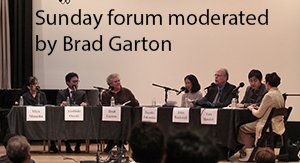 The Japanese members of the panel discussed how they understood their own identities and relationship to Japanese culture, and Ned Rothenberg and Mr. Sakai discussed microtonalism and the use of shakuhachi among Western instruments. Before the evening was done, several questions were taken from the audience. 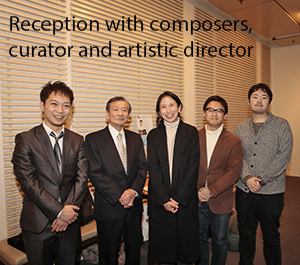 New Directions in Japanese Contemporary Music, curated by Fuyuko Fukunaka, featured the work of several Japanese composers, with a special focus on those born after 1975. The evening showcased three American premieres as well as the world premieres of two new pieces commissioned by MFJ. The concert began with Pergola by Jo Kondo—the oldest piece by far on the program. As Dr. Fukunaka explained during the post-concert panel, the piece served as a sort of stylistic and historical point of departure for the pieces that followed. 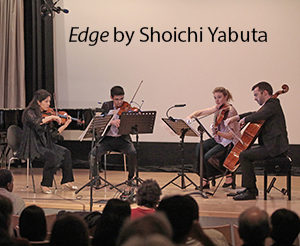 Shoichi Yabuta’s string quartet Edge came next. The piece consisted of several recurring themes—accelerating dissonant chords, dense counterpoint, and passages involving furiously executed scratch tones and other extended techniques. All of this was artfully interpreted by the fantastic Momenta Quartet. 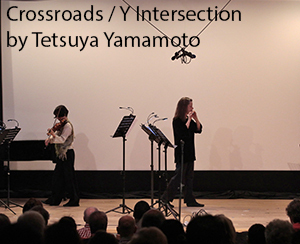 Next, Tetsuya Yamamoto’s Crossroads / Y Intersection had complex stage directions with both performers wandering about the stage while performing. The performance culminated in a full blackout of the stage. 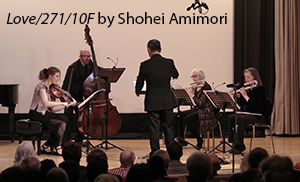 Shohei Amimori’s piece Love/27/10F began with all of the performers making a “shhh” sound in various rhythms before each eventually turned to performing on their instruments. 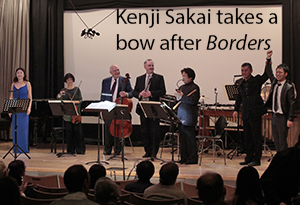 Like Borders on the previous night, Maestro Itakura conducted the piece. 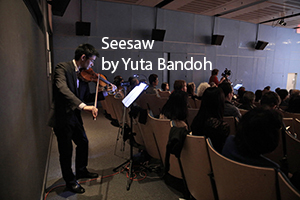 After intermission, the audience returned to hear Yuta Bandoh’s Seesaw. The piece called for preparations on the piano sonically reminiscent of John Cage’s work for the instrument. 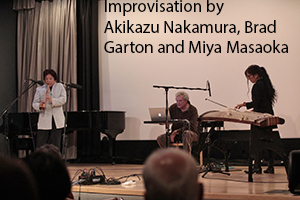 After Seesaw, Miya Masaoka (21 string koto), Akikazu Nakamura (shakuhachi), and Brad Garton (electronics) took the stage for an improvisation. 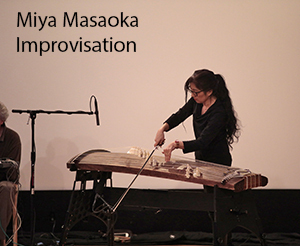 Masaoka began the piece with a staccato texture almost like the dripping of water. 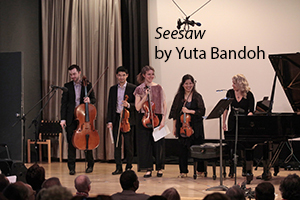 When Garton and Nakamura entered, the audience was soon immersed in a lush soundscape. 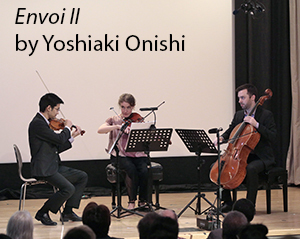 The program closed with Yoshiaki Onishi’s string trio, Envoi II. The trio sounded almost machine like, with scratchy and percussive tones repeated in an ever evolving, but repetitive rhythmic pattern. After the concert, there was an open panel led by Brad Garton with the commissioned composers, Miya Masaoka, curator Fuyuko Fukunaka, and the eminent critic John Rockwell. The main topic discussed was each composer’s relationship to their Japanese identity and how it influenced his or her music. While there were subtle differences in each artist’s answer, the prevalent sentiment was that Japanese identity was relatively low on the list of things that influenced their music, considering the globalized world we live in today.